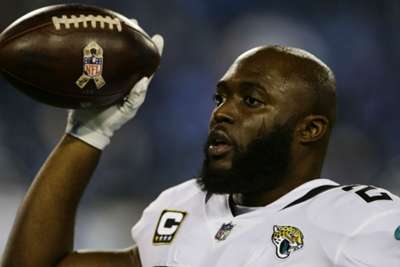 Jacksonville Jaguars running back Leonard Fournette was subject to alleged racial abuse during last week's NFL clash with the Tennessee Titans, according to coach Doug Marrone. Thursday's 30-9 defeat left the Jaguars bottom of the AFC South with a 4-9 record, but the result was overshadowed by an altercation between Fournette and a fan. Fournette was seen walking over to the stands in Nashville and arguing with a supporter before being dragged away by Jaguars staff. When asked about the incident involving the 23-year-old, Jaguars coach Marrone revealed Fournette had alleged he was subjected to racial abuse. "[Jaguars director of public relations] Tad [Dickman] showed [the incident] to me prior to our walkthrough today," the coach told a media conference. "And then when I was out on the field after our walkthrough, I met with Leonard. He said there was a racial slur, so that's what was told to me."